There Is a Greater Opportunity for Web Publishers to Monetize Traffic Than Ever Before -- www.ADXDirect.com Network Uses a Comprehensive Platform to Cater to the Needs of Its Partnering Publishers. BALTIMORE, MD -- Feb 06, 2012 -- It's a good time to be a web publisher; at least it is when a company like ADXDirect.com is making its traffic monetizing services available. Today's online environment is inducing record levels of advertising spending, largely because it's a measurable medium where technological innovations are almost instantaneously implemented by both end-users and institutions. It's no longer a question of how to monetize the traffic of a website, but rather how best to. With the many choices web publishers have, ADXDirect.com makes perhaps the most compelling option of any advertising network found online today. ADXDirect.com is finding itself at the crest of a seismic shift in advertising that is translating into more compensation for the traffic of websites. Across every vertical, advertising spending is being pumped into the interactive arena. According to the Interactive Advertising Bureau, the internet ad revenue hit $8.4 Billion in the first quarter of 2012, representing a new record and it is up from $7.3 Billion just a year ago. For ADXDirect.com, this means a bigger roster of brand name advertisers, including Coca-Cola, Warner Brothers, and Chrysler. In turn, this translates to brighter prospects for the web publishers who partner with ADXDirect.com. The benefits offered to publishers are manifold. To start, ADXDirect.com is a renowned partner service. The Baltimore-based dedicated media-buying specialists of www.ADXDirect.com will generate a competitive revenue share for publishers. Additionally, the monetization of traffic is optimized with premium rates for banners and pops. Publishers can contact these experienced online advertising pros around the clock, 24/7 via phone, email, and IM (ADXlive on AIM, Skype, MSN, and ICQ). A satisfied marketing rep at Hoster.com commented, "Your reps always answer my questions quickly and politely. I am very happy with the dependable service!" To date, web publishers have been thrilled with the offerings by ADXDirect.com, which has been only one year in the making. Another value added benefit of ADXDirect.com is the matching of domestic and international traffic with relevant advertising. Therefore international traffic, a potential revenue source that is all too often filtered and wasted, can be effectively and easily monetized with ADXDirect.com's advertising platform. This feature alone could make partnering with ADXDirect.com a wise move for publishers. A partnership with www.ADXDirect.com will help a publisher realize what separates this interactive advertising network from its peers. The reliable customer service and prompt payment scheduling; the brand name with big-money advertisers whose presence helps ADXDirect.com pay premium rates; and the contextual control offered to web publishers all create an extremely successful venture. 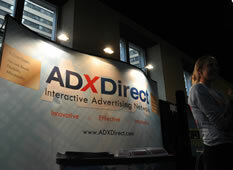 ADXDirect.com values its in-network publishers and forces zero unwanted advertising upon its partners. Partnership implies co-operation and, for ADXDirect.com, partnership means a strong degree of contextual ad control for publishers.